Since September, a San Diego man has filed nine lawsuits against properties hosting unpermitted marijuana storefronts, alleging landlords are discriminating against disabled customers. Illegal storefronts likely have a higher incentive to settle such suits rather go to court, which would make their existence much more conspicuous. Karel Spikes wanted to buy marijuana. He just couldn’t get his wheelchair through the door. Since September, the San Diego-based entertainer has filed nine civil rights lawsuits against properties hosting unpermitted marijuana storefronts. Citing state and federal disability laws, Spikes alleges that the landlords are discriminating against people like him because they haven’t provided handicap-accessible parking and entryways. Though recreational marijuana became legal in California at the beginning of the year, there are only 13 licensed dispensaries in San Diego — and illegal storefronts pop up faster than officials can shut them down. Unpermitted businesses have a higher incentive to settle such suits rather go to court, which would make their existence much more conspicuous. Spikes performs “sit-down” comedy around town and creates YouTube videos for songs he’s written, including “Love Me” and “No Drama with Obama.” He’s filed 171 lawsuits over the last 20 years, primarily with the help of two attorneys, Amy Vandeveld and Thomas Vandeveld. Neither returned requests for an interview. In each of the pot shop complaints, Spikes claims he suffered difficulty, discomfort or embarrassment by not being able to enter the dispensary. In one case, he sought upward of $1.6 million in damages. The landlords in four of those cases paid Spikes to go away rather than arouse the attention of law enforcement. Two of the landlords targeted by Spikes own other properties that have already been cited by San Diego for hosting unpermitted dispensaries. Five of Spikes’ disability suits were filed against properties in Spring Valley, an unincorporated part of the San Diego County that’s been dubbed the Wild West of illegal dispensaries. Although the landlords I spoke to denied having any knowledge of the dispensaries on their properties — they all claimed a tenant had lied about the nature of the business or subleased the site without permission — they found it cheaper to cut a check. Jami said his brothers oversee one of the properties targeted by Spikes, which is home to a car dealership on El Cajon Boulevard in La Mesa. There are cameras on site, and so Jami said the brothers were confident, based on the timeline Spikes provided in court papers, he never actually went to the property. Instead, they made a simple financial calculation and gave Spikes about $6,000 to go away, Jami said. The case was dropped in March — two weeks after the brothers also agreed to pay La Mesa $17,136 in fines. The city attorney’s office initiated its own case in October. Congress enacted the Americans with Disabilities Act in 1990 to force landlords to accommodate disabled patrons. Business groups have criticized the law as a state-sanctioned shakedown. In California, violations of a comparable disability law can cost $4,000 plus legal fees. By some estimates, more than 40 percent of all disability complaints are filed in the Golden State by a small group of career plaintiffs and their attorneys. A bill introduced last year in the Legislature would have given landlords more leverage over such plaintiffs in court, but it died. Whether the landlords knew the true nature of the businesses on their sites would likely be viewed in court as irrelevant, said two experts I spoke with. “If you’ve got a business that’s open to the public, it is required to comply with the law,” said David Peters, CEO and general counsel of the California Justice Alliance, which assists defendants in accessibility lawsuits. Nearly all of Spikes’ complaints over the years have been filed in federal court, but the dispensary cases were filed in state court. 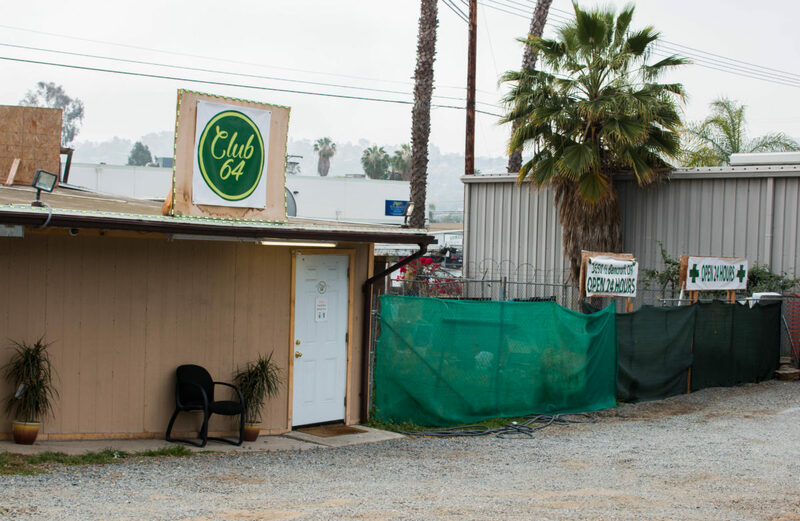 In San Diego, a lone pot shop landlord is pushing back. Spikes filed a complaint against Awad on Dec. 11, arguing that the landlord’s lack of handicapped parking, signage and pathway had denied him full and equal access “for the purposes of shopping.” Awad did not immediately respond. Six weeks later, Spikes asked the court for a default judgment, demanding $1.2 million. In February, Awad told a judge that Spikes “has not suffered any damage nor has he been inconvenienced in any manner.” Awad also labeled Spikes a “high-frequency litigant” and requested that the court charge him a higher filing fee. Thomas Vandeveld, Spikes’ attorney, responded by highlighting two times in which the San Diego city attorney’s office accused Awad of giving space to illegal dispensaries. In both instances, Awad signed an agreement promising not to let unpermitted pot shops on his property. Vandeveld also noted that the definition of a “high-frequency litigant” in California is someone who files 10 or more accessibility complaints within the course of a single year. Spikes had only filed nine. Awad told me that his site, in Spring Valley, was supposed to be used as a paint and body shop and that’s what the tenant had promised. He directed further questions to his lawyer, Quintin Shammam, who declined to comment. Shammam represented two other landlords sued by Spikes, both of whom settled. Awad’s Spring Valley property is still home to an unlicensed dispensary. There’s no record of him attempting to evict the dispensary in court. The same goes for another Spring Valley landlord who was targeted by Spikes, John Moses, although he said he’s working on it. Moses told me he was in Michigan when the guys behind the dispensary Club 64 approached him with paperwork suggesting they’d gotten the approval of marijuana regulators. In fact, San Diego County has a ban on recreational marijuana shops and has given the existing licensed medical outlets until 2022 to leave. But Moses didn’t know that, he said, and he didn’t check with authorities, so he was confused when the county threatened him with a fine. He plans to send the tenants another request to vacate the site through his lawyer. “They said they’ll move out as soon as they can find a place,” Moses said. In the meantime, he confirmed that Club 64 is still paying rent.